Greek spanakopita is usually made from phyllo dough. This paper thin unleavened dough is featured in the cuisine of many countries including Middle Eastern and Mediterranean countries, but is most famous for making Baklava, a traditional Greek dessert. The dough is used to house both sweet and savory fillings such as meats and cheeses, or nuts and honey. The texture and appearance is somewhat like that of puff pastry, but is crispier and more separated. 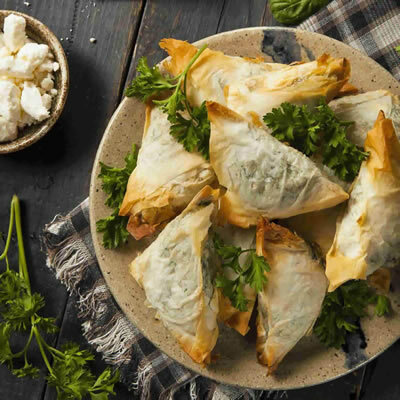 True phyllo dough was first made in Greece in the third century BCE, but Syria made the first baklava from bread dough around the eighth century BCE. This Syrian dessert spread throughout the region, becoming particularly popular in Turkey where it was called yufka. The Greeks were the first to stretch the dough making phyllo dough that closely resembles the phyllo dough of today. The process for making phyllo dough stayed remarkably consistent until 1946 when the first phyllo dough stretching machines were made. Then in 1970, these machines were further honed for mass production. It is now possible to find frozen phyllo dough in most grocery stores and super markets. Making phyllo dough is a long and time intensive process, that many home chefs choose to avoid by buying already made phyllo dough. The ingredients are simple: flour, water, oil, and raki. Other white wine vinegars are also used, as well as additions of egg yolks. To make phyllo dough all of the ingredients are combined to form dough that is repeatedly rolled and stretched out until it is paper-thin. This dough is often brushed with butter and layered to create impressive desserts and entrées. However, the dough is very temperamental. It will start to dry out within minutes of being made, so it is vital to keep it covered. It is also easy to tear, but these holes can be patched over with additional flour and scraps of phyllo dough. After fresh phyllo dough is made, it will keep for up to one week if stored correctly. It’s often used for making Bakalavas and Spanakopitas.